Welcome to my first post for Vegan Month of Food (and Blogging) - "VeganMofo 2013". For the month of September, many fellow blogger-vegan sorts like myself are super-posting wonderful recipes and vegan food-themed stuffs all over the Internet. Aiming for five posts a week! My blog entries will usually be posted very late in the day, Pacific Time, so most of you in other time zones will probably see them the next morning. Since this month of blogging is also my birthday month, AND since I'm celebrating a rather "big" birthday milestone this year, I decided the theme for my ramblings would be: "This Is What 50 Looks Like"! (Click here to read more about why!). "...Is 50 the new 30, as I've heard? Or is it the dreaded "middle ages"? Well, I'm not sure, since I don't actually TURN the big "Five-Oh" until Tuesday. But I DO know..... 50 looks like this (and I am pointing to myself). Fifty is simply what you are, and what you make of it. Sure, 50 can be exhausted and worn out (so can 30). 50 can be old (so can 30). But…how do I see 50? Ultimately, 50 is just a number. Life isn't going to change drastically in three days when I blow out birthday candles..."
I am blessed - because my Mom and I share the same birthday, September 3rd! And for almost every one of my 50 years on the planet, my Mom and I have shared a family dinner full of our favorite things and celebrating OUR special day! So for this first day of September, and this first day of VeganMoFo, I'm going to leave you with my very favorite recipe, one that's been "accidentally vegan" all my life, and the recipe I ask my Mom to make EVERY year on my birthday. In a large saucepan, mix cornstarch with water. Add remaining ingredients and bring to a boil, stirring with wire whisk. Add 4 - 5 cups peeled, sliced peaches, berries or other fruit of your choice as well as any accumulated juices. Pour fruit into 1½ - 2 quart baking dish. (an 9 X 13 glass pan or similar, you don't want it too full or it will bubble over). Mix flour, sugar, baking powder and salt in a bowl. Use a pastry blender or two forks to cut in coconut oil until mixture looks like crumbly 'meal'. 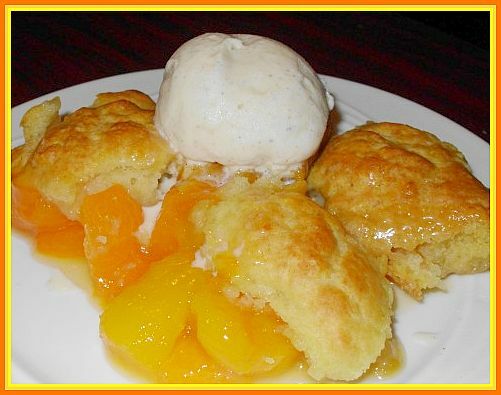 Drop dough by Tablespoons-full over hot fruit mixture. Cover as much of the top of the pan as possible, it will spread during baking. Bake for 25 - 30 minutes until cobbler top has puffed and browned. Serve warm - WITH your fave vanilla dairy-free ice cream!! That cobbler looks amazing, I've never actually had cobbler before but I know I wanna eat this one! i remember making peach cobbler in junior high. i have not had it since. i so want to make yours now! i am hungry just looking at it - for peaches & memories!